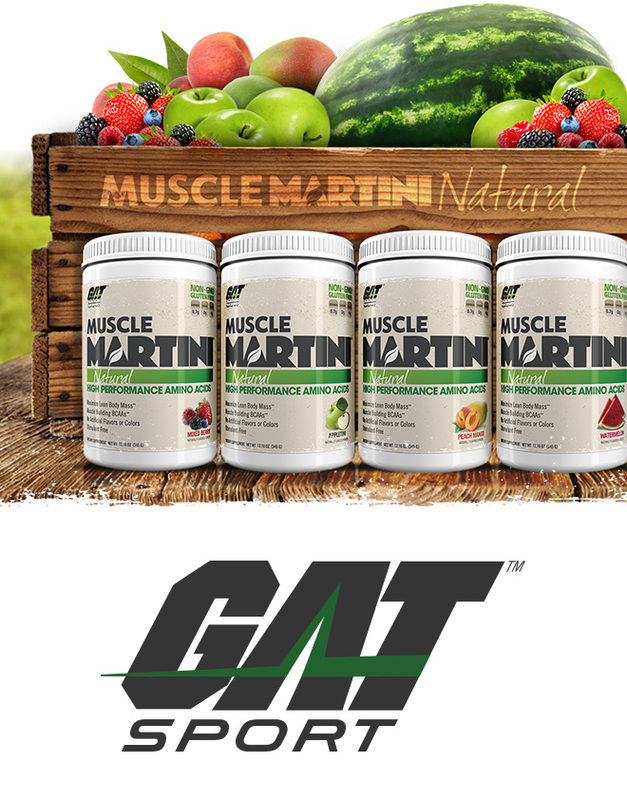 GAT Muscle Martini Natural at Bodybuilding.com - Best Prices on Muscle Martini Natural! Flavor is really dull.. When they mean no artificial flavors they mean it.. If it was more sweet or sour it would be better. Not like the apple martini you get in the bar. 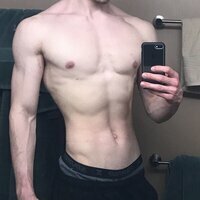 I wanted a clean muscle recovery supplement and believed I was asking for too much. I was so happy to come across this amazing produc it has everything that I wanted no artificial colors or sweetners, non-gmo and organic ingredients. The flavor is amazing on previous experiences the overwhelming sweetness from most post workouts made it impossible for me to drink but this product I drink it without a problem. If you are looking for a clean alternative look no further this will be it if you are looking for something sweet just add some stevia and it will do the trick but I personally like it just as is. Tastes and smells like old dirty socks, this is the worst and hard to drink. Save your money and try something else. This a is a nice, fresh tasting amino supplement. Peach mango is delicious. Can drink pre, post or anytime of day. Love that it has no toxic artificial ingredients. GAT MMN is by far the best I've had. I like a scoop and a half during a workout with 24 ounces of water. It's clean taste is just an added benefit to the overall benefit of staying hydrated and energized during my workout. I highly recommend trying this for 60 days straight - even on off days (1 scoop with 24 ounces of water in the morning). Watermelon 🍉 and mixed berry are my favs. An amino acid drink mix for amazing recovery combined with an organic fruit and vegetable anti oxidant blend for cleaning out the body and only a carb per serving which is unbelievable. Too much good things in one powder and mixed berry tastes great! 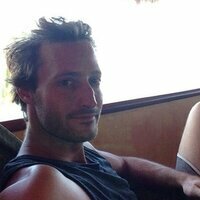 I am very picky and do not like to take most supplements because the taste. I bought this in Peach Mango to try and I love it! It doesn't have any bad after taste or tartness to it. I am definetly buying the berry after I finish this bottle! 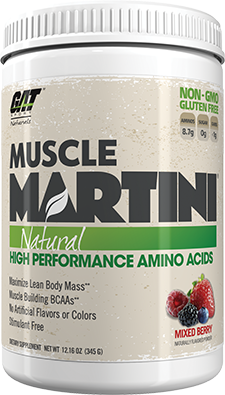 I was a big fan of Original Muscle Martini so was a bit sceptical when they released the natural version but I can honestly say it's a good product! The taste is fairly good for a natural product, mixes well and leaves no bad aftertaste. Some may feel it's not as sweet tasting as he original but your buying a natural made product so you have to expect that. I would certainly buy again! † Daily Value (DV) not established. * Percent Daily Values (DV) are based on a 2,000 calorie diet. 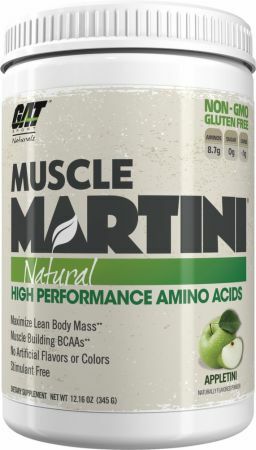 For Best Results: Recommended that you consume amino acids found in Muscle Martini® Natural throughout the day. Drinking at least two servings a day can assist athletes with performance, muscle development and recovery. 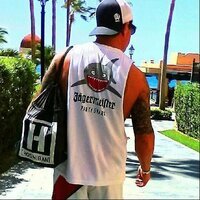 Consume on training, non-training days or when dieting. Drink pre-workout, intra and post-workout. Warnings: Consult your medical doctor prior to use if you are pregnant, nursing, or trying to become pregnant. This product is intended for use by healthy, exercising adults 18 years of age or older. This product contains chemicals known to the state of California to cause birth defects or other reproductive harm. Store in a cool, dry place with the lid firmly secured.